Just acquired an 18 size SB 305 in a SB case marked silvaloy. Were all the 18 size SB silveroid cases marked silvaloy? What can you tell us about the 18 size South Bend marked cases????? 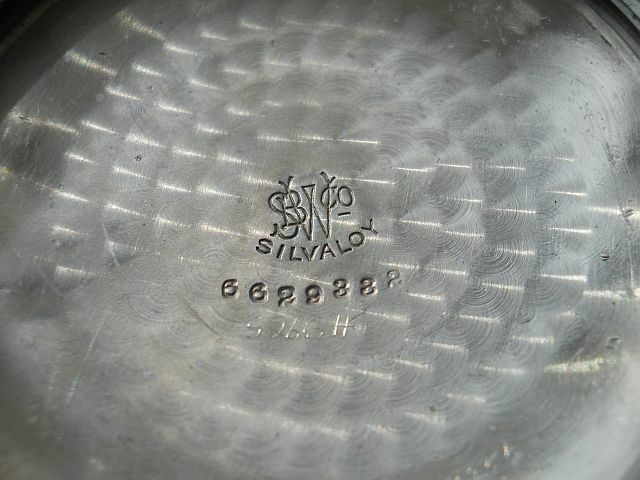 You got it right Tony, the name "SILVALOY" was the South-Bend Trade Mark for their Nickel or Nickel Alloy Cases. Practically all the early nickel-related watch cases we find have some kind of "silver" reference in the name although there is likely little if any silver in the compound from which these cases were made. I have often noticed slightly different tones among the various manufacturers of silveroid-type cases leading me to deduce there is some variation in what metals were alloyed. 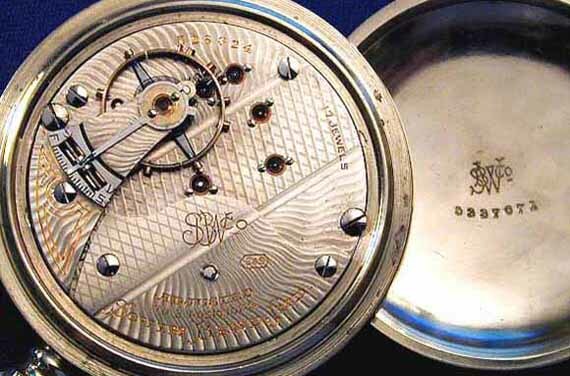 The engine-turned finish design on your case is typical of the "S B W Co" signed "Silvaloy" cases and the same intertwined S B W Co signature was used on early Gold-Filled Cases and some South-Bend watch movements as well. In the image below you will see a similarly-marked watch movement and case which makes for a rather interesting combination. Congratulations on your find, like all South-Bend marked cases the Silvaloy are very desirable. I just added a 16 size south bend silvaloy. I now have a 16 and 18 size silvaloy case. Did they make 12 size silvaloy cases???????? Do you have a 12 size silvaloy case in your collection????? If not do you know if they were made and have you seen one??? South-Bend factory cased all their 12-size watches and to my recollection they were Gold-Filled in white, green or yellow and 14K or 18K Yellow Gold. I do not recall there being any nickel South-Bend 12-size cases.